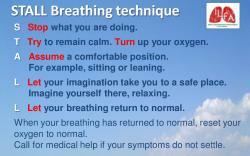 The ILFA STALL Card is designed to be carried in a wallet, purse or pocket and it has simple instructions on how to control your breathing if you experience breathlessness. Show this card to your caregiver / companion so that they can help you if you have breathlessness. (L) let your breathing return to normal. Contact ILFA by emailing info@ilfa.ie or calling 086 871 5264 to request your STALL breathing technique card.